There are four basic modular jack styles. 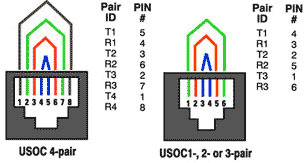 The 8-position modular outlets are commonly and incorrectly referred to as “RJ45”. The 6-position modular jack is commonly referred to as an RJ11. Using these terms can sometimes lead to confusion since the RJ designations actually refer to very specific wiring configurations called universal Service Order Code (USOC). The designation ‘RJ’ means Registered Jack. Each of these basic jack styles can be wired for different RJ configurations. For example, the 6-position jack can be wired as an RJ11C (1-pair), RJ(2-pair), or RJ25C (3-pair) configuration. An 8-position jack can be wired for configurations such as RJ61C(4-pair) and RJ48C. The keyed 8-position jack can be wired for RJ45S, RJ46S, and RJ47S. The fourth modular jack style is a modified version of the 6-position jack (modified modular jack or MMJ). It was designed by Digital Equipment Corporation (DEC) along with the modified modular plug (MMP) to eliminate the possibility of connecting DEC data equipment to voice lines and vice versa. it is important that the pairing of wires in the modular plug match the pairs in the modular jack as well as the horizontal and backbone wiring. If they do not, the data being transmitted may be paired with incompatible signals. Modular cords wired to the T568A color scheme on both ends are compatible with T568B systems and vice versa. Modular cords are used for two basic applications. One application uses them for patching between modular patch panels. When used in this manner modular cords should always be wired “straight-through” (pin 1 to pin 1, pin 2 to pin 2, pin 3 to pin 3, etc.). The second major application used modular cords to connect the workstation equipment (PC, phone, GAX, etc). To the modular outlet. These modular cords may either be wired “straight-through” or “reversed” (pin 1 to pin 6, pin 2 to pin 5, pin 3 to pin 4, etc.) depending on the system manufacture’s specifications. This “reversed” wiring is typically used for voice systems. The following is a guide to determine what type of modular cord you have. Two wiring schemes have been adopted by the “568-B.1 and “11801 standards. They are nearly identical except that pairs two and three are reversed. T568A is the preferred scheme because it is compatible with 1 or 2-pair USOC systems. Either configuration can be used for Integrated Services Digital Network (ISDN) and high speed data applications. Transmission categories 3, 5, 5e, and 6 are only applicable to this type of pair grouping. USOC wiring is available for 1-, 2-, 3-, or 4-pair systems. Pair 1 occupies the center conductors, pair 2 occupies the next two contacts out, etc. One advantage to this scheme is that a 6-position plug configured with 1, 2, or 3 pairs can be inserted into and 8-position jack and still maintain pair continuity. A note of warning though, pins 1 and 8 on the jack may become damaged from this practice. A disadvantage is the poor transmission performance associated with this type of pair sequence. None of these pair schemes is cabling standard compliant. 10BASE-Twiring specifies and 8-position jack but used only two pairs. These are pairs two and three of T568A and T568B schemes. Token Ring wiring uses either an 8-position or 6-position jack. The 8-position format is compatible with T568A, T568B, and USOC wiring schemes. The 6-position is compatible with 1- or 2-pair USOC wiring. The MMJ is a unique wiring scheme for DEC equipment. ANSI X3T9.5 TP-PMD uses the two outer pairs of an 8-position jack. These positions are designated as pair 3 and pair 4 of the T568A wiring scheme. This wiring scheme is also used for ATM. The Characteristics are specified up to 20 MHz. It is typically used for voice and data transmission rates up to and including 16 Mbps, e.g. IEEE 802.5, 4/16 Mbps UTP. The characteristics are specified up to 100 MHz. It is typically used for voice and data transmission rates up to and including 100 Mbps, e.g. IEEE 802.5, 16 Mbps UTP, ANSI X3T9.5 100 Mbps TPDDI, 100Base-TX and 155 Mbps ATM. The characteristics are specified up to 100 MHz. It supports Fast Ethernet, 155 Mpbs ATM and Gigabit Ethernet. It has Power Sum performance designed for any combination of transmission schemes and a minimum of 3 dB headroom from Category 5. The characteristics are specified up to 250 MHz. At the time of this writing, Category 6 is currently a proposal only and its subject to change. Standards should be defined at a future date. Attenuation to Near-End Crosstalk Ratio (ACR) is the difference between the crosstalk and the attenuation. Improved ACR provides additional performance and leads to the development of higher bandwidth and increased data rate transmission protocols. Attenuation is a measure of signal power loss due to the connecting hardware and is derived from swept frequency voltage measurements on short lengths of 100 Ohm twisted-pair leads before and after inserting the connector under test. Next is a measure of signal coupling from one circuit to another within a connector and is derived from swept frequency voltage measurements on short lengths of 100 meters (twisted-pair test leads terminated to the connector under test). A balanced input signal is applied to a disturbing pair of the connector while the induced signal on the disturbed pair is measured at the near-end of the test leads. ar-End Crosstalk (FEXT) is the noise induced by a transmitter at the near end into the far end receiver due to unwanted signal coupling. FEXT can be a factor in multi-pair, bi-directional signaling such as Gigabit Ethernet. Return loss is the reflected signal power of a transmitted signal. Better return loss improves signal integrity and increases performance for dual-duplex transmissions. For 100Base-TX or 100Mbps networking, JE recommends Category 5e cable. What is UTP and STP mean? Can you use telephone patch cords to connect a LAN? Do you need a special tool when working with 110-Type patch panels and jacks? Do you need a hub if using coaxial cable on a LAN? What is difference between a “Channel” and a “Link”? These terms describe two Category certification tests. These tests differ in how much of a horizontal cabling run is included for testing. The basic difference is that a link includes patching and /or equipment cords as well. One reason why channel and link tests have evolved has to do with the quality of the workman ship and materials. Channel performance is greatly affected by cable characteristics, connecting hardware, patch cords and cross-connect wiring, as well as the total number of connections and the care with which they are installed and maintained. You can go a long way toward preserving performance by simply choosing good quality components and installing them with care and proper techniques. 10Base-2 – A variant of Ethernet, connecting stations via thin coaxial cable; maximum cable distance in one non-repeated segment is 185 meters. 10Base-5 – A variant of Ethernet, connecting station via thick coaxial cable; maximum cable distance in one non-repeated segment is 500 meters. 10Base-FL – A variant of Ethernet, connecting stations via fiber optic cabling. 10Bast-T – A variant of Ethernet, connecting stations via twisted pair cabling. 100Base-FX – A variant of Ethernet which runs on multi-mode or single mode fiber optic cabling at 100Mbps. This is one version of Fast Ethernet. 100Base-TX – A variant of Ethernet which runs on Category 5 unshielded twisted pair wiring at 100Mbps. This is one version of Fast Ethernet. 1000BaseX-C – A variant of Gigabit Ethernet which runs on twinaxial cable. 1000Base-LX – A variant of Gigabit Ethernet which runs on multi-mode and single mode fiber optic cable at a 1330 um frequency. 1000Base-SX – A variant of Gigabit Ethernet which runs on multi-mode fiber optic cable at an 850 um frequency. 1000Base-T – A variant of Gigabit Ethernet which runs on unshielded twisted pair cable.